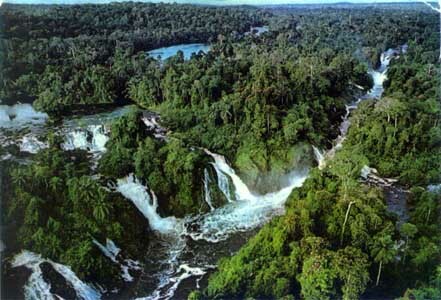 Despite what some government groups are trying to promote, human greed is the main cause of rainforest deforestation. Incredibly, between May 2000 and August 2005, Brazil lost more than 132,000 square kilometres of forest — an area larger than Greece — and since 1970, over 600,000 square kilometres (232,000 square miles) of Amazon rainforest have been destroyed. But what are the reasons behind why so much rainforest habitat is being systematically cut down and burned? Well, here are a number of obvious causes, such as wood being used for the world's timber magnets, land clearance for farming and road construction. But that's not the whole story, because - contrary to belief - the trees in the Brazilian rain forest are probably the best protected anywhere on earth - at least in theory, but someone is still cutting them down and burning them. For several years now, the Brazilian government has insisted that the rate of deforestation in the Amazon has declined sharply. But earlier this year, it suddenly jumped again, to a rate five times higher than last year. These trees play a vital part in the management of global weather patterns. Why? Because they absorb carbon dioxide, which otherwise would contribute to climate change. That is why Brazil is under pressure to protect the forest. 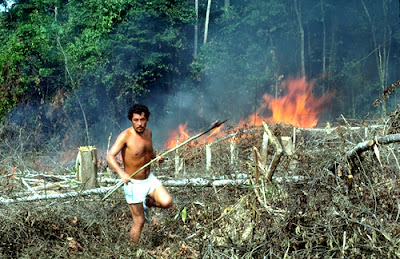 Perhaps the biggest threat to the Amazon rain forest are the Amazon settlers as they burn down the trees to clear land for cattle. Amazon settler Waldemar Vieira Neves understands this, but he says there are other considerations as well. He is is a small, wiry man, 64 years old, with sharp features and a deep sense of grievance. He has lived there for 12 years, ever since the government offered him the opportunity to start a new life as an Amazon settler. He used to live in the far northeast of Brazil, with no land and not much hope. So, like tens of thousands of other settlers, he took the opportunity and did what the government wanted him to do - made a new home for himself in the forest and cleared the trees. Nowadays, Brazil's laws on deforestation are extremely strict. No-one who farms in the rainforest is supposed to be allowed to cultivate more than 20% of the land he owns. The rest has to be left untouched, as a way of preserving the forest and protecting the environment. But sometimes, says Waldemar, people feel they have to break the law. What else can you do if there is no other way to survive? The settlers complain that they need more help in finding ways to make a living while keeping on the right side of the law. They say they need education, not punishment, if the government wants them to farm the land but protect the trees at the same time. Within the next few months, Brazilian President Dilma Rousseff, who came to office six months ago, will have to decide whether to veto proposals to relax the Forest Code, which restricts how much land in the Amazon region can legally be cultivated. Farmers and big international agricultural business groups say they need to be able to farm more land to provide the food that the world demands. 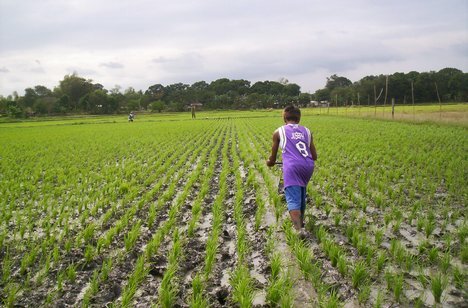 They want an amnesty for farmers who may have cleared forest land illegally in the past, proposing that - instead of being fined - farmers who have broken the law should be required to buy more forest, equivalent to what they have cut down, in return for an undertaking to leave it untouched. Brazil now exports more beef than any other country in the world, and agriculture makes up a quarter of the country's entire economic output. It is also the world's second biggest producer of soya, which is an essential ingredient in animal feed, and pressure from the huge soya producers south of the Amazon who are desperate to buy more land is pushing smaller farmers like Waldemar Vieira Neves deeper into the forest. On the one hand, President Rousseff does not want to risk jeopardising Brazil's rapid economic growth by damaging its powerful agribusiness interests. On the other, she is under intense pressure from environmentalists not to approve any law that could encourage more deforestation in the Amazon. Before her election last year, she pledged to veto any plan that would weaken the Forest Code and, within the coming months, she is going to have to decide whether to honour that pledge. WHAT IS ‘SLASH AND BURN’ FARMING AND HOW DOES IT AFFECT THE RAINFORESTS?